If you are a regular WhatsApp user, the following three facts might hold true for you (if not, it’s likely to happen sooner or later). One, most of your friends or family are already on WhatsApp. Two, some of these friends or relatives have included you in multiple WhatApp groups. And three, you get countless number of messages from these groups every day; most of which are usually just random jokes, catchy memes or funny audio and video clips. Such catchy stuffs are usually downloaded for a quick laugh, only to be forgotten afterwards. As time goes by, you may even grow tired of these messages and start considering them as spams. By that time, it’s usually too late. You can’t leave the group; someone might eventually notice and add you back. And blocking is not an option, as most of the people who send such messages may actually be close to you in real life. Meanwhile, media downloaded from WhatsApp chats could occupy considerable space on your phone over time. And when you need to free up space, it’s a daunting task to browse through all your media collections and manually delete the ones you don’t need (which includes all the cartoons, memes, screenshots, greetings, etc., mostly coming from WhatsApp chats). Magic Cleaner for WhatsApp is a junk cleaner for Android that scans relevant WhatsApp folders and automatically identifies junk media files for removal. 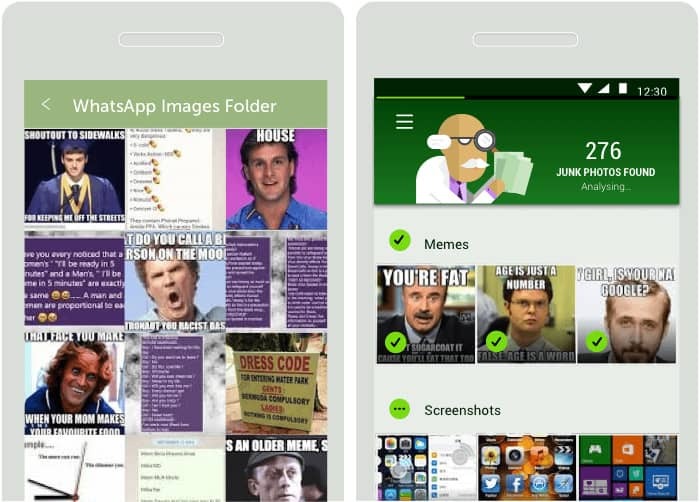 It uses advanced machine learning techniques (deep learning and neural networks) to categorize WhatsApp junk into different groups (for example, screenshots, cartoons and memes, quotes, greetings, videos, etc.). Once identified, you can manually select the specific media files to be deleted. Download and install Magic Cleaner for WhatsApp. Launch the app and tap on the head of “Doctor Kleen” at the bottom of the screen. The app will now start analysing your WhatsApp photos and videos for junk. When analysis is complete, you can find the list of identified junk files, grouped under different categories. Unselect the ones you choose to keep, and tap on the Delete button. Your WhatsApp media folder should now be free of junk photos and videos. Note: Though Magic Cleaner identifies junk quite accurately, it may wrongly identify a useful photo as junk on a few occasions. Thus, it is recommended that you manually verify the items selected for deletion before actually deleting them. Magic Cleaner may occasionally upload your photos and videos to their servers for analyzing them. If you don’t want such uploads to happen while you are using a cellular data connection, you can set Magic Cleaner to do this only on WiFi. Open the app menu by tapping the top left hamburger icon and choose Settings >> Use only WiFi. Now that you know how to remove junk WhatsApp photos and videos automatically, what are you waiting for? Just download Magic Cleaner from Google Play and get going. Magic Cleaner is currently available only for Android, but an iOS version is also in the works. So, stay tuned!